The Louvre and Airbnb have joined, to offer an entire night at the Louvre in the company of the Mona Lisa and the Venus de Milo to the winner of a competition. The completion has been launched to mark the 30th anniversary of the building on the Pyramid. The winner will be chosen by a jury for his or her response - funny, appropriate or creative - to a question that was posted during the week on the Airbnb platform. The question runs as follows: "How would you host the Mona Lisa?" The dream night offered in the largest museum in the world will be offered for the night of April 30 to May 1. A special program is planned for both guests. The winners will be greeted by an art-historian, who will take them on a bespoke tour, like those previously given to the Obamas, Beyoncé and Jay-Z. Once they have discovered the museum's wonders, the winners will enjoy their 'Home for the night' in the presence of some truly legendary hosts: they will toast the Mona Lisa with a Renaissance inspired aperitif, while relaxing on a sumptuous Parisian lounge sofa, listening to the atmospheric sounds of French music on vinyl records. Venus of Milo, the Greek goddess of love and beauty, will then “host” an extravagant dinner in a pop up dining room. 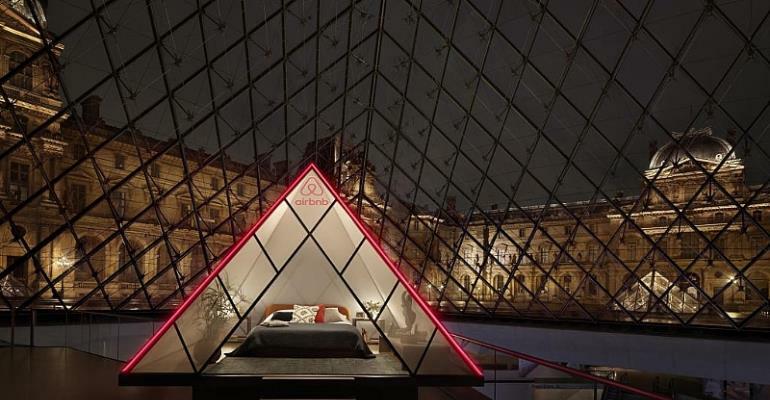 They will also sleep under the Louvre's iconic glass Pyramid in a “mini-pyramid” that will be specially designed to celebrate the building's 30th anniversary. "With the support of Airbnb, we want to make our collections open to people who do not normally turn to the museums. Our objective is to make art accessible to all," said Anne-Laure Béatrix, General Administrator assistant of the Louvre Museum. The special booking is part of Airbnb's "Night At" franchise, a series of once-in-a-lifetime stays at some nifty locations. Previous "Night Ats" were held at Dracula's Castle, a LEGO House and a Shark Aquarium. With 10.2 million visitors in 2018, the French museum is the most visited in the world. Airbnb has concluded this partnership while it is under the fire of the critics of the mayor of Paris for not respecting the regulations in terms of rental. The city has recently sued the platform, punishable by a fine of 12.5 million euros, for putting online 1,000 unregistered homes, as provided by the Elan law. To enter the compettion, go to airbnb.com/louvre before April 12 at 23h59 (French time – GMT+1) and answer this question: why would you be the Mona Lisa's perfect guest?.